A multi-purpose and long lasting anti friction chamois cream formulated just for women. It’s pH balanced for the female anatomy, and also contains the natural antifungal and antibacterial tea tree oil. Premax Women’s Anti Friction Cream reduces the friction and subsequent abrasion of skin to skin or fabric to skin contact. What’s special about Premax Women's Anti Friction Cream? This smooth, refreshing and effective cream will last for hours, so you can ride or hit the training track with confidence, knowing that you’ll be protected from chafing, saddle sores, friction burns, and skin irritation from rubbing. Premax Women’s Anti Friction Cream is formulated to benefit the sensitivities of your delicate, private areas. The pH of this cream is moderately acidic (pH 4.0 – 4.5) to match the pH of the female anatomy. If pH levels rise above this level issues can arise such as bacterial vaginosis and infection, so keeping the pH at the right level will help reduce the possibility of health complications. Most skincare products have a pH of 5.0-5.5 to match normal skin, so choosing a specific anti chafing product to apply close to, or directly on your private areas is very important. Premax Women’s Anti Friction Cream also contains tea tree oil, an essential oil with both antifungal and antibacterial properties. As well at this cream being long lasting, pH balanced for women, and antibacterial, it’s also packed full of premium skin friendly ingredients. There’s soothing Aloe Vera, another natural antibacterial and antioxidant, and Quandong and Desert Lime which are both rich in Vitamin C and powerful skin rejuvenators. There’s Rosehip Oil which is packed full of skin-nourishing vitamins and essential fatty acids, and Macadamia Oil boosting the skin’s barrier function and reducing water loss. Further skin nourishment and moisturisation comes from Shea Butter and Vitamin E.
The consistency of Premax Women’s Anti Friction Cream is beautiful. It has a medium consistency - not watery and thin, or a thick paste. It’s a gentle, soothing and silky cream that washes out of clothes and cycling knicks easily. Our super light and dry Sports Sunscreen SPF50+ and Weather Protection Facial Cream for windy and cold conditions are also a wonderful adjunct to our anti friction creams. For wetsuits and those who prefer a stick balm, please take a look at our Anti Friction Balm. How should you use Premax Women's Anti Friction Cream? Apply the cream to where it’s going to rub, before it hurts. Once your skin starts to break down with chafing, it’s too late. For cyclists, this is the area around your private areas, and the inner part of your upper thigh. Some people apply it to their knicks, some to the skin, some both. It doesn’t really matter as long as you get it in the right spot. For runners, it’s usually between the upper thighs, around chest straps, bras and tight upper body garments. How much should you apply? What you do, your skin type, the humidity on the day, your clothing, your seat, how long you exercise/ride, and how much you sweat all play a part. Some people get away with as little as 5mL (1 x teaspoon), others need 30mL (tablespoon) or more per ride/session. After a few sessions with Premax Women’s Anti Friction Cream you’ll work out what’s right for you, but to start it’s better to use a little more than a little less for obvious reasons. And for those who exercise all day (and night), you should reapply every 3-5 hours. “Premax Women’s Anti Friction Cream is the benchmark in female chamois creams. It was developed in conjunction with a bunch of elite female riders and cycling teams, and you can tell. It’s totally effective on my long rides, and I now won’t use anything else”. Test product for any skin irritation on a small area of the skin prior to use. Apply generously and evenly at least 5 minutes before starting your activity. Reapply frequently especially after excessive sweating or prolonged activity. For endurance events, reapply every 3-5 hours. If irritation develops, discontinue use. Store below 30°C. "I’m very proud that I was there at the beginning of the Premax journey with Randall, helping him a little to test and refine the first ever Premax creams. It’s now the go-to brand for sports skincare for athletes and elite sporting teams, and it’s great to watch this Aussie brand continue to develop both here and overseas." 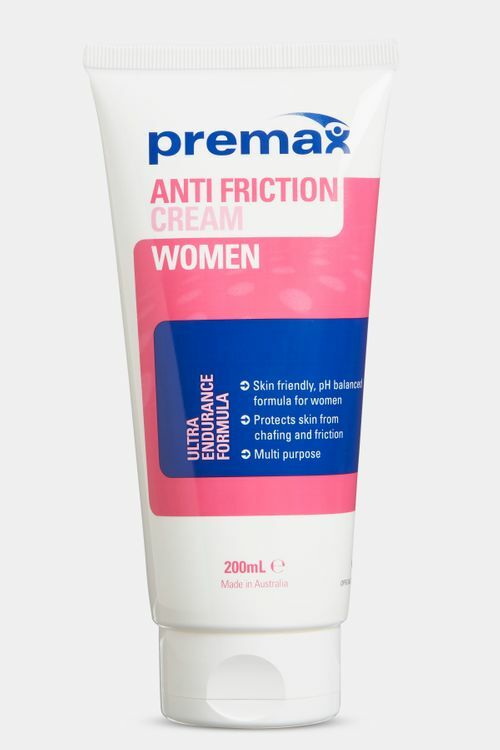 I’m so excited that Premax has an anti friction cream specific to women. It ensures that I’m comfortable on those long rides allowing me to produce the best effort and power without being distracted by discomfort in the saddle. It’s long-lasting, soothing and consistent thus enabling me to ride happy and comfortably no matter the distance. When getting kitted up for a training ride, applying Premax chamois cream and sports sunscreen are a part of my morning routine. I rank those as important as putting on my helmet and sunglasses. I never venture out for a ride without the protection of Premax Women's Anti Friction Cream. Saddle sores and chafe can be uncomfortable and painful, taking the enjoyment out of riding and training, and subsequently my performance can suffer. Premax Women's Anti Friction Cream helps keep any irritation at bay and allows me to ride in comfort for hours on end. An exercise-specific, breathable and long lasting facial cream, which protects the skin in windy, cold, dry and harsh conditions. A non-slip sports grip balm applied to the hands or sporting equipment to enable superior grip and control in all weather conditions. It’s long lasting, sweat and moisture resistant, and has a clean, dry finish. A multi-purpose, skin & clothing friendly, ultra-endurance anti chafe balm. This product will help protect your skin from chafing, blisters, friction and rubbing as well as keeping your skin in good condition. A warming, premium quality massage lotion consisting of olive oil, wintergreen, shea butter, cocoa butter, vitamin e, and glycerin. Premax Sports lotion is long lasting, wipes off easily and moisturises the skin. Get the very latest premium content and member-only special offers from Premax. Only one (awesome) email a week - we promise!